Hasbro’s Nerf team has always been good at designing blasters. But when it came to designing darts, they never quite hit the mark (literally). 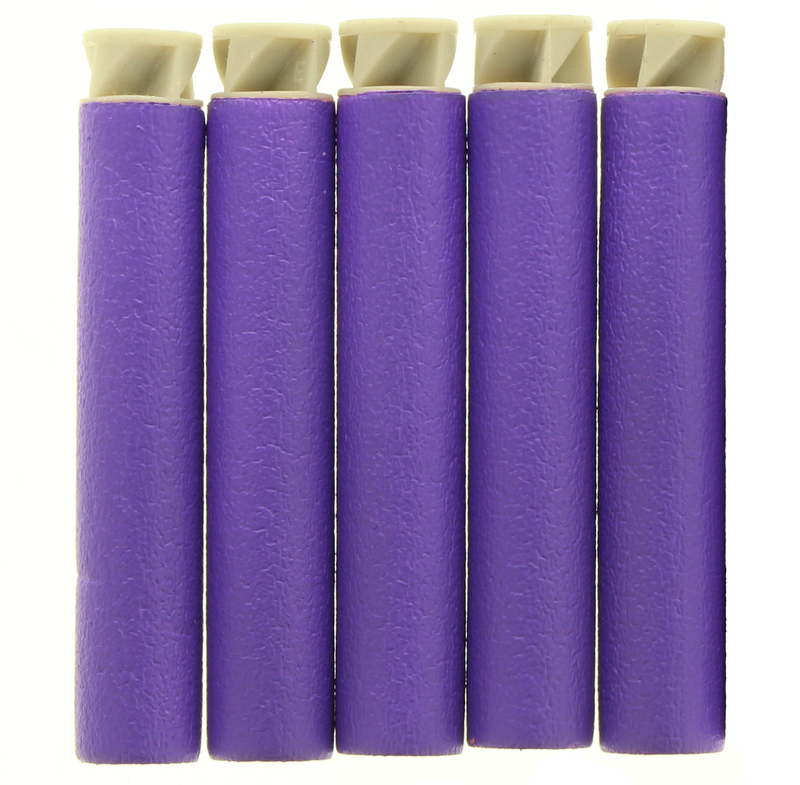 In fact, it was this consistently poor dart performance that led many to jump on Mattel’s BOOMco bandwagon, in the hopes of finding a blaster that could fire darts accurately without extensive modifications. Recently, however, BOOMco has become something of an afterthought, releasing blasters with little fanfare, and generally only with some contrived pulp culture tie-in (so-called “licensed” models). What better time, then, for Hasbro to jump in with an all-new product line focused primarily on improved accuracy? 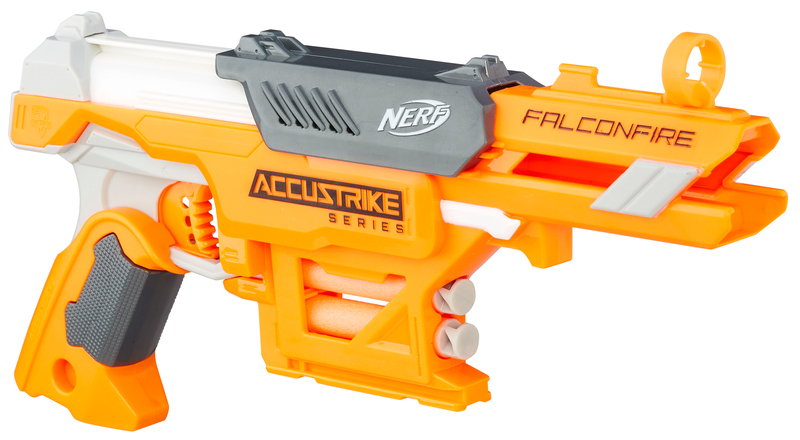 Enter the Nerf Accustrike Series, featuring blasters that fire a brand-new type of Nerf dart promoting improved accuracy! In years past, Hasbro only seemed interested in releasing Nerf blasters with greater and greater claimed ranges–even going so far as releasing a whole line of “XD” (Extreme Distance) blasters that didn’t actually improve on ranges at all (but allowed them to more prominently market them as such). However, Nerf sites like this one (and my former Blaster Labs and About.com sites) have put just as much emphasis on accuracy as outright distance. After all, what good is a 50 foot shot with a 12 foot spread? For me personally, I’d take accuracy over distance any day of the week, because I just don’t see the point of shooting a blaster if I can’t hit my target. And that’s why my blaster of choice is typically a BOOMco model, and my foam dart of choice is typically a Buzz Bee Extreme–the latter being a type of dart that is significantly heavier than typical Nerf Elites, the mass of which tends to smooth out flight patterns at the cost of outright distance. 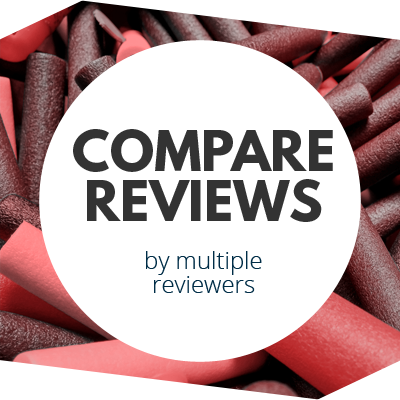 And that brings us to the all new Nerf Accustrike Series, which was first officially announced on the (sometimes) tech-oriented gossip site “Gizmodo.” We’re friendly with the folks over there, so it was great to see them get the scoop. Of course, we had already published a few pictures that surfaced online several days prior to the officially unveiling, but only now are we getting high-res imagery and full product details–including the appearance of two, new Rebelle models. 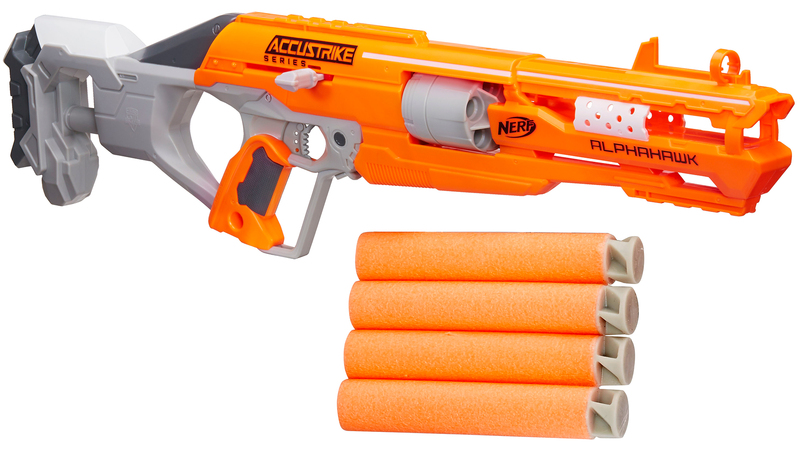 We’re also seeing the Nerf Accustrike darts themselves, which appear to focus more on aerodynamics and perhaps overall weight distribution as the key contributors to improved accuracy. This makes some sense, since a higher mass projectile would require greater blaster propulsive force in order for the darts to reach typical “Elite” distances. And that would likely cause some safety concerns. It also appears Hasbro wants these darts to be cross-compatible with Nerf Elite products, so the overall size and shape couldn’t change significantly. 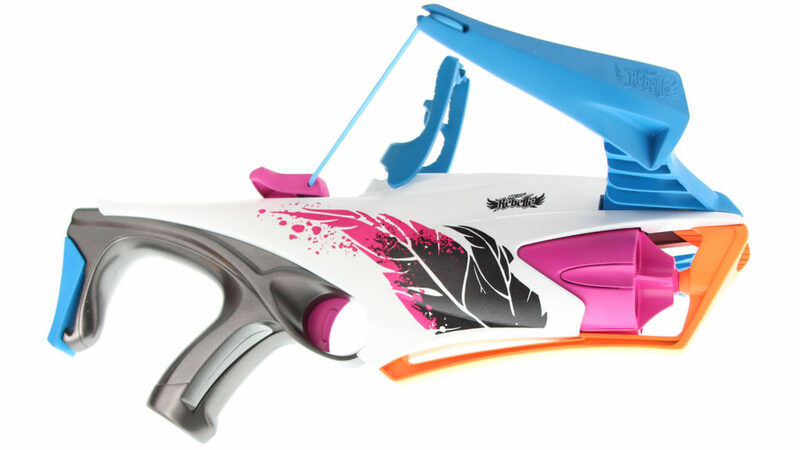 All things considered, I’m cautiously optimistic about the new Nerf Accustrike Series products. 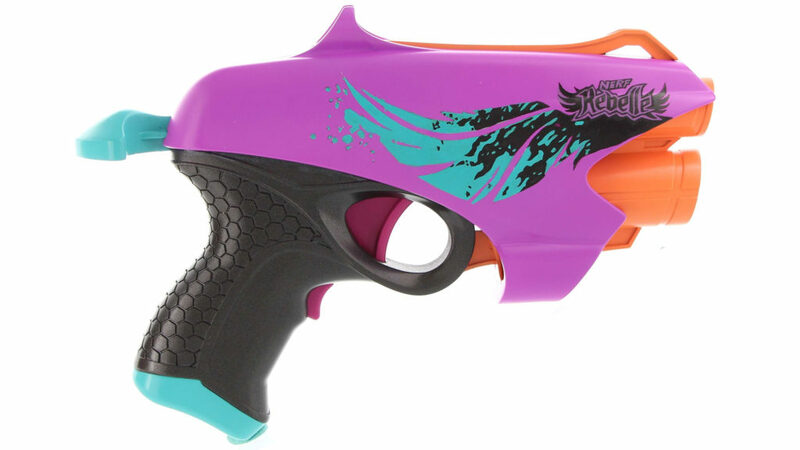 I’ve been particularly vocal about the need for improved accuracy from Nerf darts, though the fact that Hasbro chose to do a low-key unveiling via a tech blog versus a bigger press event during a year of so many other high-profile blaster releases has me concerned that the actual product may not be light-years beyond existing designs. And to go one step further, Hasbro’s PR arm didn’t even tell us about them at all–to this day, we’ve not received anything from them directly–almost as if they’re concerned we’ll talk too much about it (and potentially be vocal about any deficiencies). Hmm. 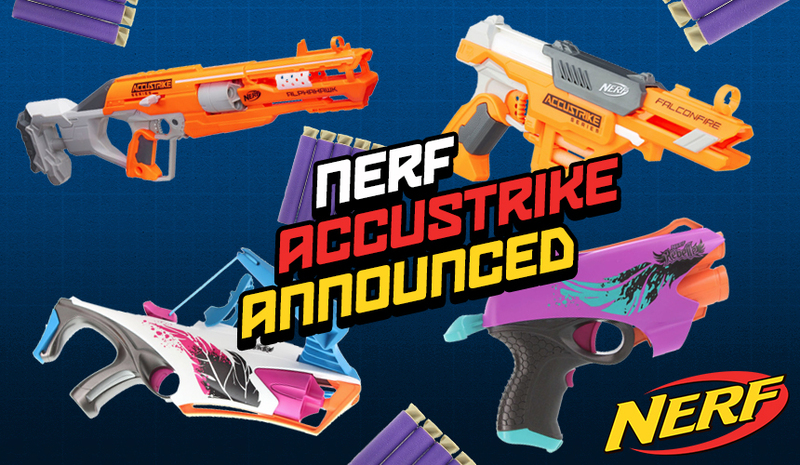 But on with the show… below is the full Nerf Accustrike Series line-up we know about right now. 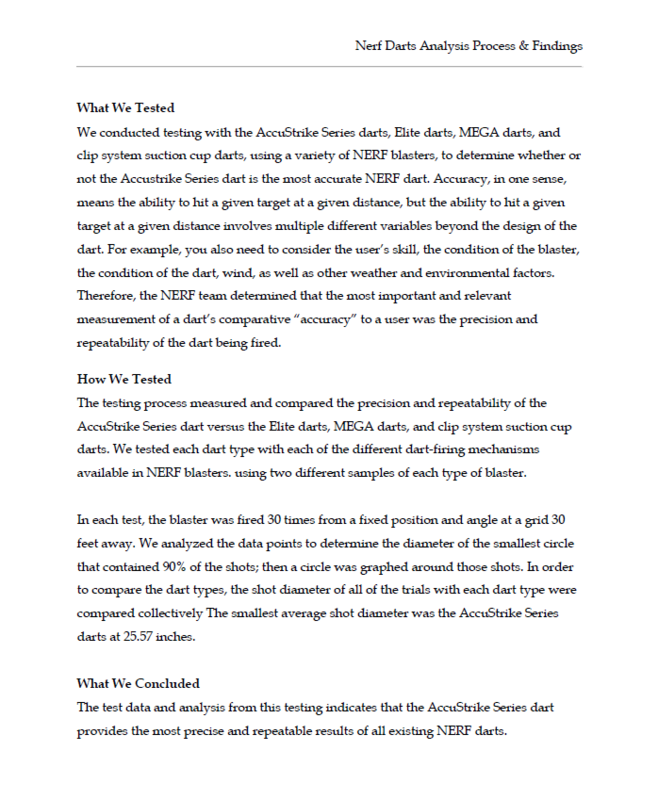 And below the official imagery and descriptions is a little “how we tested” write-up from Hasbro (it’s not terribly technical, but at least we get a better idea of how the Nerf development team defines accuracy). We’ll be sure to post any additional info if and when it becomes available! 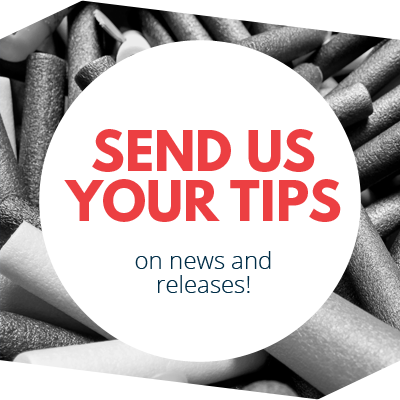 This entry was posted in News/Updates and tagged accustrike, nerf, new on October 10, 2016 by PMindemann. I really want those two guns :3 plus some the whole rival line !